With the countdown having very much begin, we round up our 10 best dog gifts for your furry friend this Christmas. 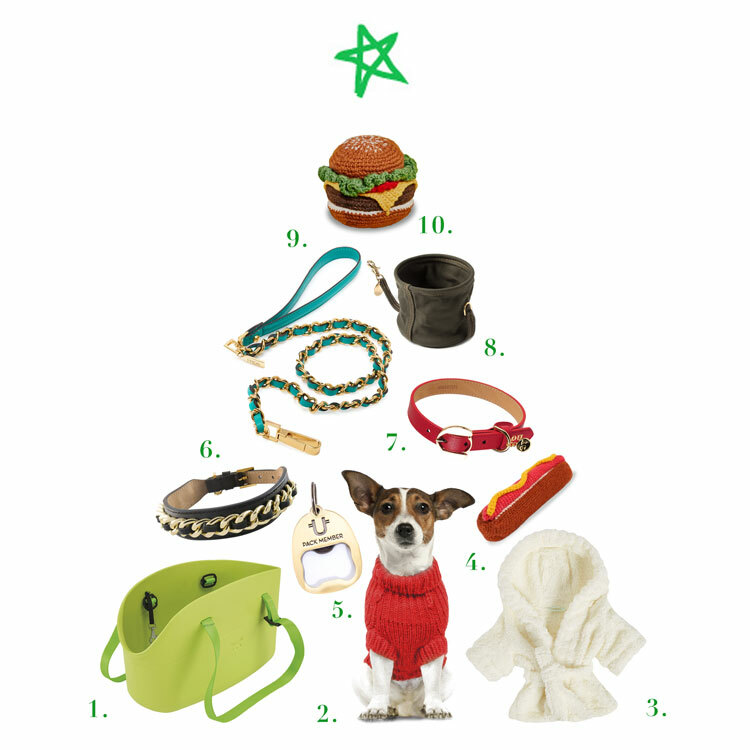 Whether they’ve been naughty or nice, our must-have dog accessories are guaranteed to satisfy this festive season. From high-end dog collars to fun dog toys, we bring you a selection of the finest canine gifts your dog will love. When there’s snow or grit on the ground, transport your dog wherever you need to go with total ease in a hypo-allergenic dog carry bag from Ferplast. Made from the same innovative hi-tech rubber as the brand’s ergoflex range of dog collars, leads and harnesses, these lightweight and practical dog carry bags are super sturdy, durable and 100% wipe clean. Wrap up your dog in style this Christmas with this thick cable knit dog jumper in bold festive red. Hand-knitted in top quality, pure natural wool for softness, comfort and maximum warmth, this is a Winter classic to bring out year after year. Christmas just isn’t Christmas without lounging around in your favourite onesie or PJs, so while you enjoy lazy moments in front of the TV, let your dog enjoy the same relaxed comfort in their very own bath robe. Not just a piece of pretty petwear, these super soft dog bath robes are great for slipping on after bath-time while your little pups fur dries off. Another from New York’s finest canine outfitters, these 100% lambswool hand knitted hotdogs are the perfect toy for your dog to enjoy this Winter. Made from the finest wools using all natural dyes and now containing an internal squeaker for double the fun, these food inspired fair trade dog toys are produced by craftswomen of Nepal. Not having a bottle opener at your party will be a thing of the past, thanks to Australian canine outfitters, Pethaus. Made from Antique brass, these super cool dog ID tags combine a bottle opener function with space for your important owner details should your pup ‘walkies’ further than they should this party season. For the little dog who likes to pack a style punch, this luxury dog collar ticks all the high-end style boxes. Fashioned with soft nappa leather and embellished with a gold chain, your dog will have the fanciest dog accessory this season and be the envy of the pack. If you and your dog have a taste for the finer things in life, this elegant dog collar from luxury pet label Moshiqa will be your kind of treat. Constructed in beautifully soft nappa leather, luxury gold hardware and the brand’s signature tag, this classic leather dog collar is guaranteed to get many admiring glances this party season. After overindulging in Christmas treats whilst visiting relatives this festive season, ensure your dog has a portable water bowl to hand. In strong and sturdy commercial-grade canvas, this collapsible dog water bowl is suitable for kibble or water, simply clip the solid brass hardware onto your lead or bag and go. For the dog who’s been good all year long, spoil them with this stunning designer dog lead, which takes luxury leads to the next level. Handmade in Italy, this beautiful dog lead is constructed with premium quality nappa leather interwoven through gold chain and finished with a super soft leather handle. Brought to you by one of New York’s finest canine outfitters, these 100% lambswool hand knitted burgers are the perfect toy for your dog to enjoy this Christmas. Made from the finest wools using all natural dyes and now containing an internal squeaker for double the fun, these food inspired fair trade dog toys are produced by craftswomen of Nepal.